Many people now are becoming interested in therapeutic horsemanship as a career. Here at Horses Helping People we have a range of courses to help you. We are often asked by people if they can spend time with us to learn how we work. To protect our clients’ privacy we do not allow this, but you can learn about our way of working by booking onto one of our courses. We welcome anyone interested in learning more about therapeutic horsemanship for professional reasons or personal interest. You also have the satisfaction of knowing that your course fee contributes to the running of the therapeutic programmes. 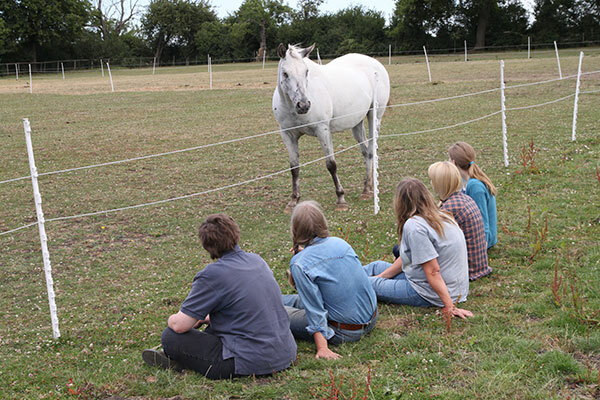 Our courses are based on our extensive knowledge of bringing together horses and people in a way that benefits both, combining our experience of working with people from a variety of backgrounds with non abusive horse training. Horses Helping People is primarily a working therapeutic horsemanship centre, so we continue to develop our skills on a daily basis. Now is your chance to share this. We can offer practical advice and inspirational information, based on professional experience and a lifetime of learning. We have a range of one and five day courses – take a look at our set courses, or contact us with your individual requirements for a tailor made course.